The first snowfall always brings with it a great dose of emotions among Canadians. For some, it remains an exciting event that transforms the landscape into a winter wonderland, marks the beginning of the winter sports season and announces the upcoming holidays. For others, it can be a rather frustrating time. Slippery roads, snowy driveways and cold extremities often lead the list of complaints. Regardless of where you are on the spectrum, that first snowfall means that the weather and road conditions become a central talking point - even more so than usual. Many can probably relate to being asked (or asking) the following two questions. “How was your drive here? Have you got winter tires? While few will debate the superiority of winter tires in snowy conditions, there are always a number of drivers who opt to “make do” with what they’ve got and run all-season tires year-round. A key factor in that decision is almost inevitably the purchase price of winter tires, wheels, and tire pressure monitoring system sensors. And that’s without considering the hassle of shopping for those winter tires and wheels and getting them installed. Leading many to wonder, is it worth the hassle? There is no denying that winter tires are significantly better than all-seasons for tackling wintery driving conditions. There has been no shortage of independent tests to support this. It’s been proven time and again that winter tires stop, accelerate and handle better on snow and ice. In fact, their softer rubber compound remains flexible for better overall handling when temperatures drop below 7 degrees, meaning that even on dry pavement they will be better suited to handling cold temperatures. Moreover, this holds true whether your vehicle is front-wheel drive, rear-wheel drive or all-wheel drive. While having traction going to all four wheels does reduce the chance of getting stuck and helps drivers accelerate from a standstill, it doesn’t play much of a role when it comes to braking distances. While Ford vehicles offer the very latest safety and traction technologies, it is important to remember that tires are the final link to ensure that your vehicle handles responsively and instills confidence in your driving. And there’s more. Having two sets of tires means that each set will last considerably longer. In other words, in addition to the added safety of winter tires, they also represent a long-term investment in your vehicle. Mounting them on a second set of wheels represents an added advantage, as this eliminates the risk of potential damage that can be caused by remounting and means that your summer wheels can be kept away from the salt and grit present on the roads during winter. Essentially, winter tires provide a ton of benefits, with the only drawback being the up-front (but worthwhile) investment. At Jubilee Ford, we have the solution to this conundrum. Until November 30th, we’re proud to offer Ford’s Winter Performance Package when you purchase or lease select new models. * This full bolt-on/bolt-off winter tire solution includes: 4 winter tires, 4 winter wheels and 4 Tire Pressure Monitoring System sensors - an MSRP value up to $3,333. Ford’s Winter Performance Package has been designed and tested by experts at Ford, to ensure your vehicle is ready to tackle winter. Combining this package with the advanced capabilities and safety features of Ford vehicles means you should be set for many winters to come! Want to know more about this offer? 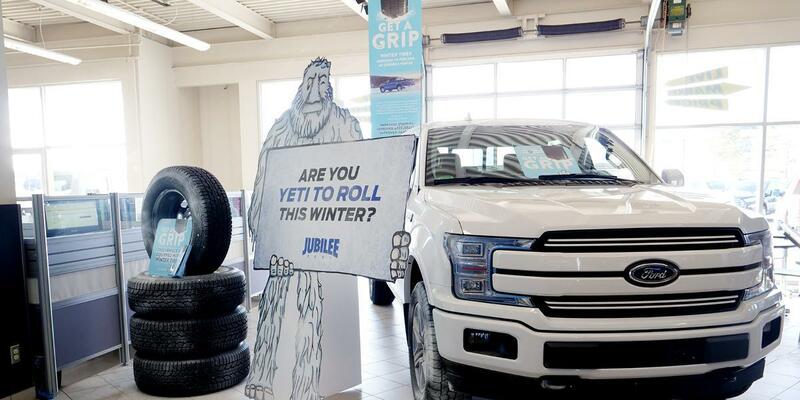 Drop by Jubilee Ford in the Saskatoon Auto Mall, where our team will be more than happy to answer all your questions! *This package will be available when you purchase or lease any new 2018/2019 Ford Fiesta, Focus, Fusion (excluding Sport), C-Max, Escape, Edge (excluding Sport), Explorer, Taurus, Flex, Expedition, EcoSport, F-150, or F-250/F-350 SRW.